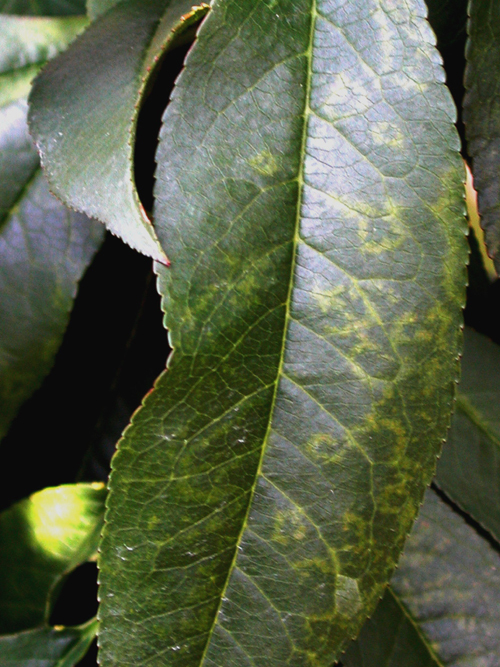 Plum Pox symptoms on peach leaves including yellow rings, lines and vein clearing. Courtesy Ontario Ministry of Agriculture, Food and Rural Affairs. © Queen's Printer for Ontario, 2010. Reproduced with permission. Cause Plum pox virus (PPV) of which there are several strains. The disease was found in North America for the first time in 1999 in Pennsylvania and has now been detected in New York and Michigan as well as Ontario and Nova Scotia, Canada. Periodic surveys for the virus since 2000 have not found the virus in the Pacific Northwest nursery industry or Oregon's cherry orchards. After 10 years of eradication efforts, Pennsylvania was declared free of the virus in 2009 meeting the requirement of three consecutive years of testing negative. Michigan has also eradicated the disease. There are 7 strains known including PPV-D, which is the one found in the US. Globally, PPV is the most economically important virus of stone fruits. PPV infects all Prunus fruit tree species, almond, and many ornamental trees. In Europe, wild Prunus species are reservoirs of the virus. Herbaceous hosts include an array of common weeds, such as white clover and nightshades. The virus can survive in the roots of rogued infected trees and can also spread by natural root grafting. Suckers produced from the remaining roots of rogued infected trees carry the virus and therefore must be removed if control is to be achieved. PPV is transmitted by aphids in a nonpersistent manner and is retained by the aphid for no more than a few hours. Aphids appear to spread the virus not to immediately adjacent trees but to trees several spaces away. Systemic spread of the virus within a tree may take several years; in the meantime, the virus may be distributed very irregularly. Seed transmission in Prunus is known not to occur with the D strain, but there are some reports of seed transmission with the M strain. Long-distance spread is through distribution of infected budwood and nursery stock. Experimental transmission from infected fruit to hosts has been shown and could be a possible mechanism for long distance spread. Symptoms Many trees do not show symptoms for up to 4 years after initial infection. 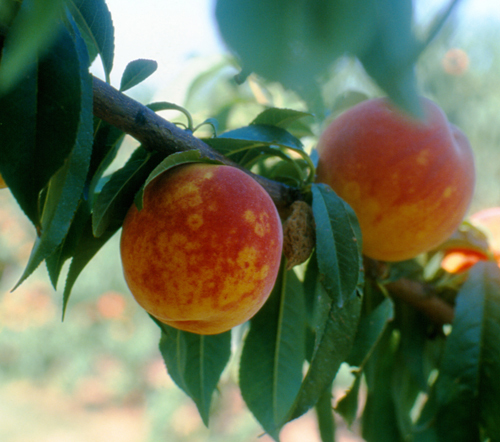 Symptoms can be severe on many cultivars of apricot, plum, and peach trees. However, the type and severity of symptom development depends on the particular cultivar. Sweet and sour cherries were confirmed as natural hosts. Symptoms may appear on leaves or fruits of infected trees and are particularly evident on leaves in spring when chlorotic spots, bands or rings, vein clearing, and even leaf deformation is evident. Infected fruits show chlorotic spots or rings, and diseased plums and apricots are deformed with internal browning of the flesh and pale rings or spots on the stones. Much of the affected fruit drops prematurely, 20 to 30 days before the normal maturity date, and fruit that does remain on the tree lacks flavor and is low in sugar. Symptoms; however, are highly variable. Controls The best control is preventing introduction. At all times use propagative material that has been tested and found free of all known viruses; this is fundamental to preventing introduction to new areas. If introduced, an aggressive eradication program is exercised. Reference Mavrodieva, V., James, D., Williams, K., Negi, S., Varga, A., Mock, R., and Levy, L. 2013. Molecular analysis of a Plum pox virus W isolate in plum germplasm hand carried into the USA from the Ukraine shows a close relationship to a Latvian isolate. Plant Dis. 97:44-52. Plum pox virus. Pennsylvania State University.